With the dress I’m wearing I’m demonstrating how I repaired and laundered this item. Vintage clothing was made during a time where clothes was made to last. Many of my collection date to over 60 years old, and they’re still looking marvellous, with a little care and maintenance these items will last for many years to come. I do hope you enjoy today’s video, and if you’d like to see more on the topic of vintage fashion, please do comment below. And be sure to subscribe to never miss out on one of my vintage videos! 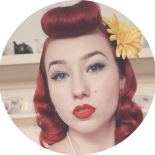 This entry was posted on April 6, 2019 by Miss Lady Lace in Fashion, Pinup, Videos, YouTube and tagged 1940's, 1950's, blogger, glamour, miss lady lace, miss lady laces pinup blog, perth, perth pinup, perth pinup blog, perth pinup community, pin up, pinup, pinup blog, pinup blogger, pinup fashion, pinup girl, pinup life, pinup lifestyle, pinup perth, red lips, retro blog, retro girl, retro glamour, the perth pinup community, victory rolls, vintage, vintage blog, vintage blogger, vintage fashion, vintage girl, vintage glamour, vintage perth, vintage pinup blog.